Lion Corporation (President: Itsuo Hama) announces the release of Fleuria, a hair care series for the mature woman that promotes beautiful and healthy hair, on June 19, 2013, available only through mail order. The Fleuria series consists of three products: Fleuria Medicated Hair Nourishing and Restoring Essence, containing the dual-action hair-nourishing ingredient 6-benzylaminopurine to promote hair growth and prevent hair loss, along with Fleuria First Conditioner and Fleuria Second Shampoo, which help maintain a healthy hair and scalp environment while promoting volume. *From the French à fleurir, to bloom. Adopting the elegant, long-blooming orchid as its image, the brand seeks to convey the vitality and elegance of the mature woman. Women place a lot of importance on their hair. Worries about thinning and loss of volume increase as they age, especially during their 40s and onward. The market for hair-nourishment treatments for women has been growing steadily, with the usage rate among women in their 50s and older particularly high (among women in their 40s, 50s and 60s, usage rates are 6%, 12% and 17%, respectively). However, of those women who have used hair-nourishment treatments, 49% feel that many such treatments and related conditioners weigh down their hair, leaving it flat and lifeless. 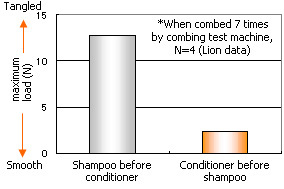 Based on this data, Lion realized that women desire hair that is lighter and full of body after washing. What’s more, a Lion behavioral observation survey of women concerned about thinning hair found that a number of women limit their use of conditioner in order to achieve lightness and volume. Lion’s research into hair nourishment dates back to the 1980s. Research focusing on the signals that govern the functioning of the hair matrix cells from which hair grows led to the identification of the active ingredient 6-benzylaminopurine, which amplifies signals that stimulate hair growth and suppresses signals that trigger hair loss. Research into the causes of thinning hair in women began in 2004, with a particular focus on the role of hormones. The product of 30 years of research, Lion’s new Fleuria Medicated Hair Nourishing and Restoring Essence incorporates the dual-action hair-nourishment ingredient 6-benzylaminopurine to promote hair growth and prevent hair loss. Furthermore, to maintain the health of the hair and scalp and create full-bodied volume, Lion is simultaneously releasing Fleuria First Conditioner and Fleuria Second Shampoo, which are recommended to be used in that order: the conditioner first, followed by the shampoo. By selling the Fleuria series only through mail order, Lion hopes to be in a position to continuously provide information to and communicate directly with women concerned about their maturing hair and scalp, supporting them in their desire for full-bodied volume. The active ingredient 6-benzylaminopurine both promotes the signals that stimulate hair growth, which taper off with age, and suppresses the signals that trigger hair loss. Antioxidant piroctone olamine: Prevents oxidization of sebum, one cause of hair loss, while also reducing dandruff and itchiness. Blood flow stimulant nicotinamide: Promotes blood circulation in the scalp. Contains 12 moisturizing botanical extracts: Plectranthus, Cladosiphon okamuranus, Rosmarinus officinalis, Angelica keiskei, Zingiber officinale, Perilla frutescens, Glycine max, Angelica acutiloba, Citrus reticulata, Swertia japonica, Eriobotrya japonica and Citrus ichangensis. · Pump-type nozzle makes applying a measured amount easy. · 15 to 20 pumps twice a day is recommended. Ceramides* help amino acids (histidine, arginine) penetrate deep into the shafts of damaged hair to replenish moisture from within. The Lion proprietary repair agent DGA (a natural polyphenol derivative) soaks into the hair cuticle to alleviate dryness. Contains eight moisturizing botanical extracts: Cladosiphon okamuranus, Rosmarinus officinalis, Angelica keiskei, Rosa multiflora, Sanguisorba officinalis, and red, green and brown algae. The scalp-softening ingredient PEG (polyethylene glycol) soothes irritation and promotes scalp health. Contains 11 moisturizing botanical extracts: Cladosiphon okamuranus, Rosmarinus officinalis, Angelica keiskei, Zingiber officinale, Perilla frutescens, Glycine max, Ziziphus jujube, Daucus carota, Prunus serrulata, Lillium, and Curcuma longa. Removes sebum from pores and other grime from the scalp for the improved penetration of hair nourishing and restoring essence. 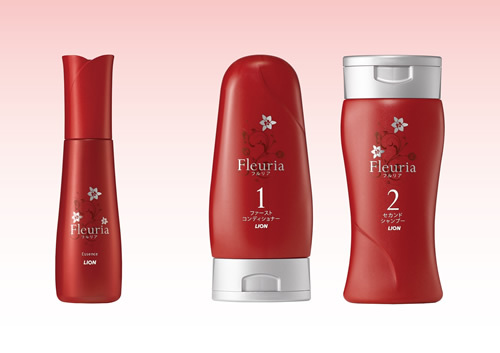 ♦ Using Fleuria Second Shampoo after Fleuria First Conditioner removes excess conditioner from the scalp and hair, ensuring full-bodied volume. The moisturizing and repair agents in Fleuria First Conditioner provide continuous care to both the inner structure and outer surface of the hair, even after shampooing. To brushed and wetted hair, apply conditioner and work it through the hair, rinse thoroughly and then shampoo as usual, rinsing again afterward. 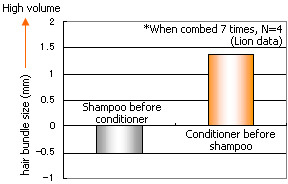 Using conditioner before shampoo reduces breakage by preventing tangling during washing. Using shampoo after conditioner removes excess conditioner from the hair and scalp, creating body and volume. The moisturizing and repair agents in Fleuria First Conditioner provide continuous care to both the inner structure and outer surface of the hair, even after shampooing.